Santa Claus will be busy trying to supply presents for this family. An American woman has given birth to her eighteenth child - and her husband says the couple want still more children. The fact that they are only giving their children names beginning with the letter 'J' has not slowed them up one bit. Last night Michelle Duggar delivered the baby girl by Caesarean section at a hospital in Arkansas. The baby, named Jordyn-Grace Makiya Duggar, weighed 7 pounds, 3 ounces (3.26 kilograms) and was 20 inches (51 centimetres) long. "The ultimate Christmas gift from God," said Jim Bob Duggar, the father of the 18 children. "She's just absolutely beautiful, like her mom and her sisters." The Duggars, who are evangelical Christians living in Bible-belt America, now have 10 sons and eight daughters. Jim Bob Duggar said Michelle started having contractions Wednesday night. She needed the Caesarean section, her third, because the baby was lying sideways. Jim Bob said both baby and mother were doing well last night. "We both would love to have more," he said. The U.S. cable network TLC broadcasts a weekly show about the Duggars, called "Seventeen and Counting." Chris Finnegan of TLC - which handles public relations for the Duggar family - said the show's name would be updated to account for the latest addition to the family. He said TLC also will air a show Monday on the baby's delivery. The other Duggar children, in between Joshua and Jordyn-Grace, are Jana, 18; John-David, 18; Jill, 17; Jessa, 16; Jinger, 14; Joseph, 13; Josiah, 12; Joy-Anna, 11; Jeremiah, 9; Jedidiah, 9; Jason, 8; James, 7; Justin, 6; Jackson, 4; Johannah, 3; and Jennifer, 1. "Our whole family is excited about Jordyn's addition to our family," Jim Bob Duggar said. "She's just perfect in every way." The fast-growing family lives in Tontitown in north-west Arkansas in a 7,000 sq ft home, and the children are all home-educated. 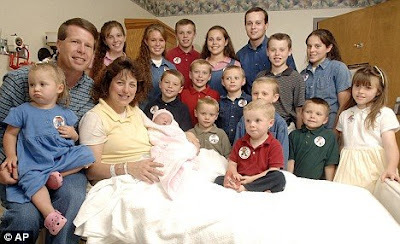 Mrs Duggar has been been pregnant for more than 11 years of her life. She and husband Jim Bob – evangelical Christians - said in a recent interview they would keep having children as long as God wills it. "The success in a family is first off a love for God, and secondly treating each other like you want to be treated," Mr Duggar said. "Our goal is for each one of our children to be best friends, and everybody working together to serve each other makes that happen."